Favorite Halloween Drink, eh? Ok, this was a little hard for me, only because I don't partake in alcoholic beverages. Oh sure, I've tried a Pumpkin Beer or two, but it's not for me. Nothing against it, just don't like the taste. That doesn't leave me with a lot of "Halloween Drinks" though. But guess what, there's still hope for a boring straight edge dope like me! JONES SODA BLOOD ORANGE AND ECTO COOLER. Awwww yeah! I just couldn't pick one! They're both my favorites, past and present. Always look forward to sipping a mini can of Jones Soda while eating a plate of Cheetos Bag of Bones. It's sweet, a little tangy and always has a sweet looking vampire on the can. How can I go wrong? Plus I won't feel as guilty drinking a tiny can. And yes, I'm very aware Ecto Cooler isn't exactly Halloween, but you can't tell me you wouldn't consider it either. 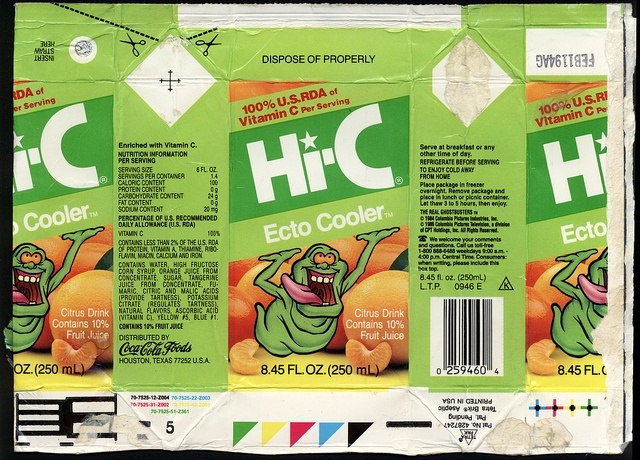 I have plenty of childhood memories of drinking it in kindergarten when it first debuted, so I'm sure it found it's way to a Halloween party or two in my childhood. That and, Ghostbusters. Duh. What would be your choice? Sound off in the comments! That means you, Emmanuel Lewis! I'd smash those together like Stone Cold & drink em both at the same time.